Which is more dangerous, a politician or a contributor? No, that’s not a question in Levitt’s Freakonomics book, but it might as well be since his principles definitely apply to the political world. 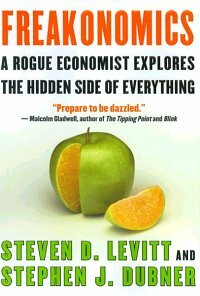 Steven Levitt, an economist, and Stephen Dubner, a writer and journalist, came together last year to write the best-seller Freakonomics: A Rogue Economist Explores the Hidden Side of Everything. The book is a must read. Levitt makes you think. Hard. His approach is a somewhat complex, but simple theory that reveals the domino effect behind many events. While exploring hidden explanations, the authors ask ‘unasked questions’. After all, it’s not always the questions we ask, but the questions we do not ask that matter. A good detective asks the right questions. I am intrigued by Levitt’s insight on incentives. He asks how do people get what they need or want when others need or want the same things. This is a key concept in politics. Thus Political Freakonomics is born, at least for me. For instance: Kip Holden was elected as Mayor-President of East Baton Rouge Parish. Holden and others go to elaborate detail explaining how he won. Like all political campaigns, theories abound and the non-participants take credit. (I define non-participants as the disillusioned individuals who choose to live in denial by believing they were the tipping point in an election.) There is almost always a little truth in what we believe. But if we press forward, and ask the right questions, we might be surprised at what is uncovered. Holden wants us to believe he was elected mayor because he has crossover appeal and presented a message that crossed racial, gender and age barriers. The political freakonomics question is: WHO was behind the election of Kip Holden? The answer is simple. Baton Rouge Next, and some extremely talented political consultants that made a firm decision to remove former mayor Bobby Simpson from office. They created a campaign called “Anybody But Bobby” and an aggressive political campaign to unseat him. The field was broad and as it narrowed, Holden won the support of BR Next and became our mayor. Now that’s what I call Political Freakonomics!